Front Row (Left to Right): Chase Evans, Luke Balciunas, John Thomas, Kade Gorman, Sam Bleisch, Bryce Gatewood, Aaron Helms. Back Row (Left to Right): Alexa Roberts, Zachary Freeman, Brooke Haflich, Jackson Parrish, Savannah Congrove. 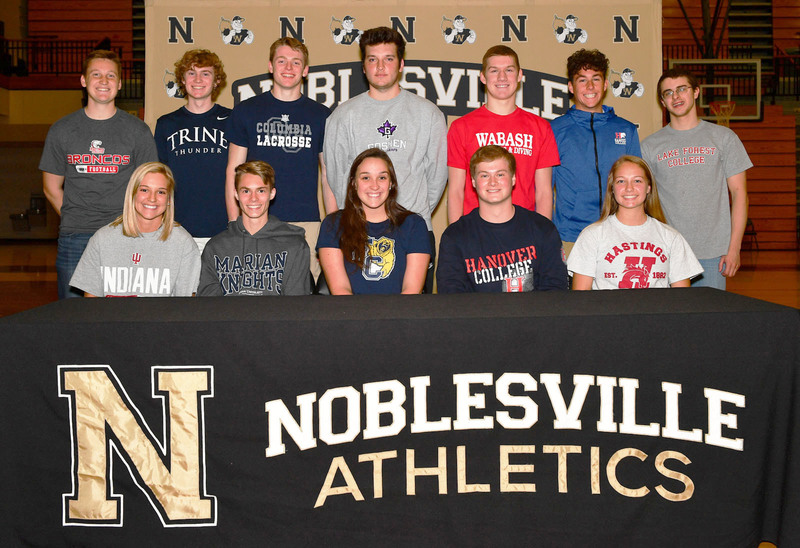 Noblesville Athletics celebrated Spring Signing Day with twelve student-athletes along with their families and friends on April 27 in The Mill. This was the final Signing Day event for NHS this school year. Front Row (Left to Right): Laney Balciunas (Sister), Brenda Balciunas (Mother), Luke Balciunas, Ramunas Balciunas (Father), Lexie Balciunas (Sister). Back Row (Left to Right): Kent Graham (Noblesville Boys Cross Country Head Coach). 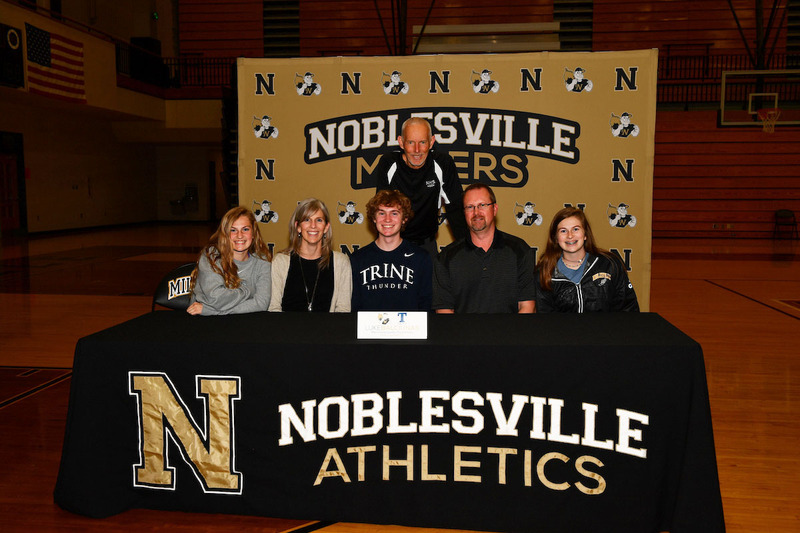 Why I Chose My School: I chose Trine University because I thoroughly enjoyed the coaching staff and the dean of the business school. Both were very inviting and kind and showed that they put a large amount of time and effort into guiding their students. 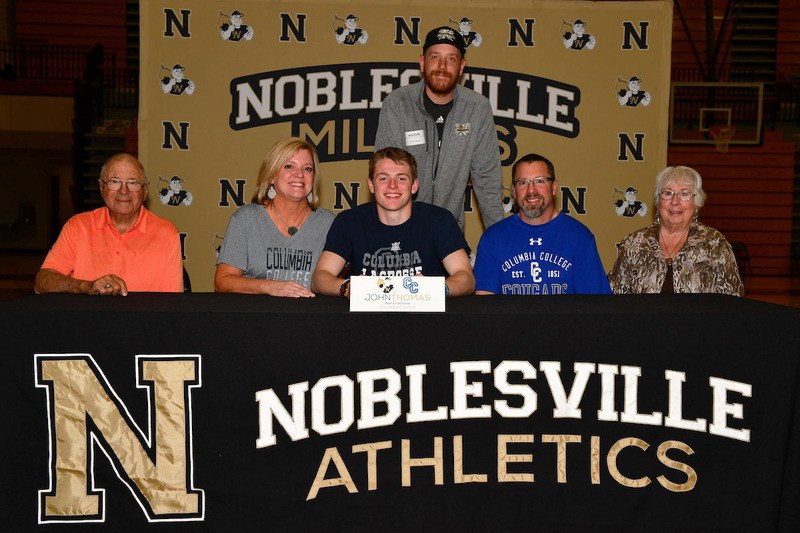 I also have two friends that graduated in 2017 that enjoy being there and have helped in solidifying my decision to attend Trine in the fall of 2018. How I Want to Get Involved: There are several student fellowship groups at Trine and I look forward to getting involved with one. My Biggest Inspiration: Someone who inspires me is my grandfather, who immigrated to the United States from Lithuania during World War II. He had to completely restart his life and work around countless barriers. He learned English, got a job, was involved in his community, and took great care of his family. It is his success story that inspires me to explore new business ideas and work hard every day. I Would Like to Thank: I would like to thank my parents for not letting me slack off. My parents constantly badgered me to get my work done. And because I didn’t like them always reminding me to get to work, I learned to get things done early. This helped me in building a strong work ethic that has helped me throughout my high school career. I would also like to thank my coaches for showing me how great of a sport running can be and motivating me to train year-round. They too have taught me the value of hard work both in and out of running. Front Row (Left to Right): Annette Bleisch (Mother), Sam Bleisch, Tom Bleisch (Father). 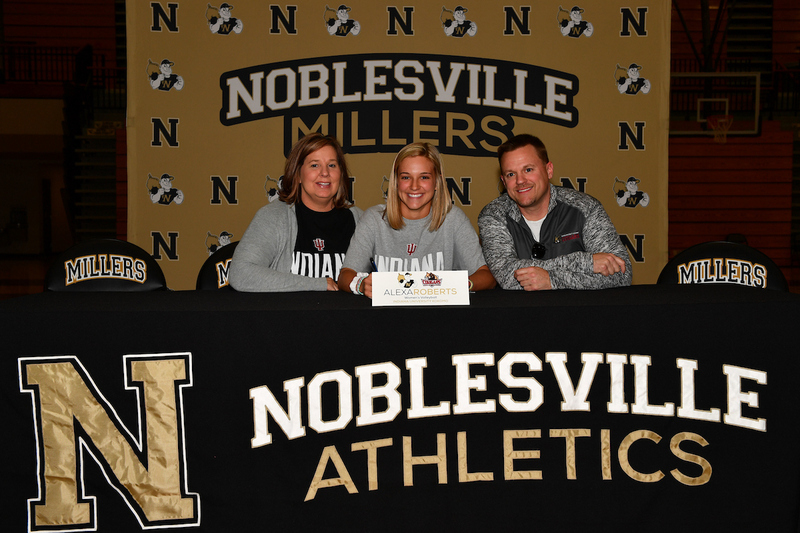 Back Row (Left to Right): Rich Wolfred (Noblesville Swimming & Diving Head Coach), Aleks Fansler (Noblesville Swimming & Diving Assistant Coach). 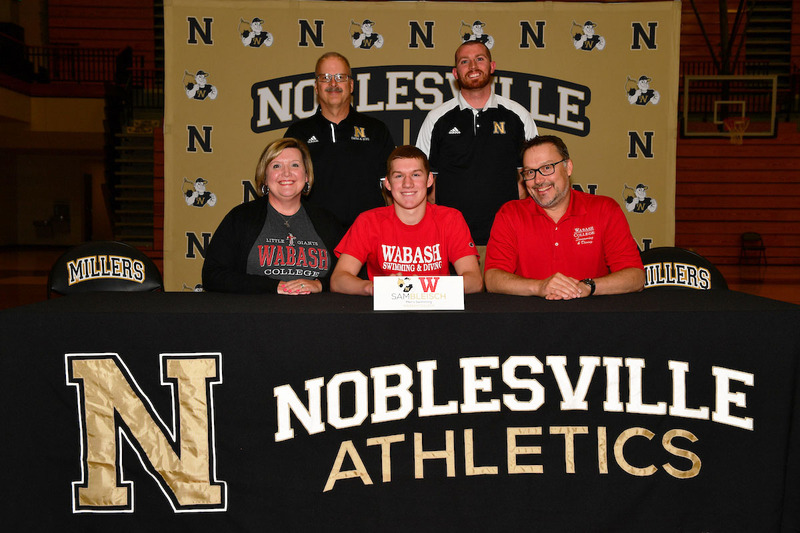 Why I Chose My School: I chose Wabash because with a smaller class size there is more room for discussion among students and Professors. I will be able to form closer relationships with my professors than I could at a big university. How I Want to Get Involved: I hope to get involved with the Wabash Democracy and Public Discourse, where you go out into the community and help with public forums and other governmental affairs. I also plan to be an active member of Wabash College Democrats and Lambda Chi Alpha. I Would Like to Thank: I would like to thank both my parents for supporting me in my swimming career and my brother Zach and Coach Natalie for pushing me to swim in college. Front Row (Left to Right): Tori Congrove (Sister), Amanda Congrove (Mother), Savannah Congrove, Todd Congrove (Father), Lila Congrove (Sister). 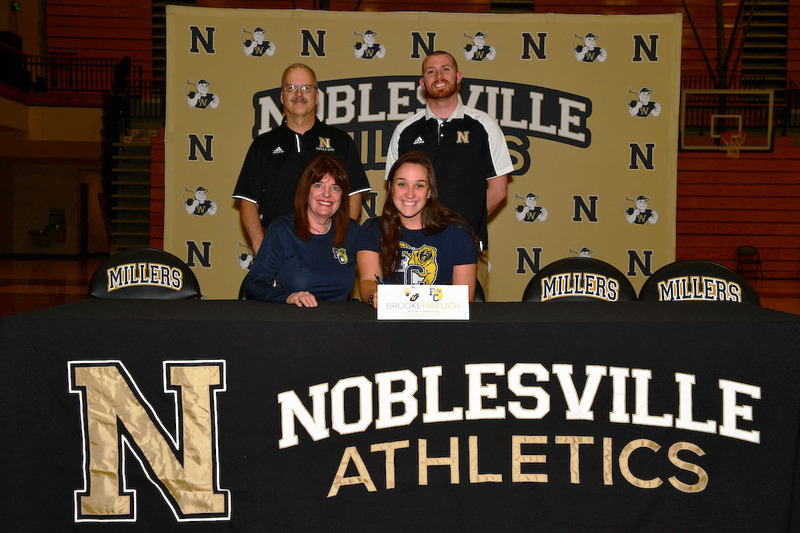 Not Pictured: Dennis Scheele (Noblesville Girls Cross Country and Track & Field Head Coach). Why I Chose My School: I chose Hastings College because it is a smaller school where the students are known and supported. The Wildlife Biology program is excellent, and the small class size will give me experiences I couldn’t find elsewhere. Hastings College also offered me the opportunity to be a college athlete which has been a long time dream and goal. How I Want to Get Involved: I look forward to meeting new people and getting involved in student clubs and possibly the Greek Life. I currently enjoy volunteering and serving through my church. I’d like to continue that at Hastings by participating in some of the many service and outreach opportunities they have. My Biggest Inspiration: My parents are my biggest inspiration. They have always made a great effort to attend my meets, games, and activities. My parents are supportive and encouraging while also gently pushing me to work harder and improve. Despite the outcome of my efforts, they love me unconditionally and always believe in me. I Would Like to Thank: I would like to thank my coaches for investing in me over the years. Their training and encouragement have helped to make me the confident athlete I am today. My teammates have been great at pushing me in practices to improve and excel. I’d like to thank my parents and sisters for not only supporting me but supporting my teammates and our program. Front Row (Left to Right): Bella Wyatt (Sister), Jeff Wyatt (Father), Chase Evans, Shayna Wyatt (Mother). 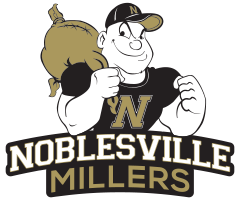 Back Row (Left to Right): Lance Scheib (Former Noblesville Football Head Coach), Austin Anderson (Noblesville Football Assistant Coach), Jay Taylor (Noblesville Football Assistant Coach). Why I Chose My School: I chose Hastings College because I believe that it will be the best fit for me both athletically and academically. This was one of several schools that I had the opportunity to play for; the school atmosphere and the quality of education were what attracted me to the college. Hastings College also was able to award the most academic money of any of the schools, so that I will not be completely reliant on athletics through college. How I Want to Get Involved: I look forward to meeting all new people, making new friendships, and getting involved with a new community far away from home. My Biggest Inspiration: My biggest inspiration would have to be my mom and dad. They are always pushing me to better myself and never letting me slack off no matter how much I want to. They always inspire me to try new things, and they don’t let me give up. I Would Like to Thank: First, I would like to thank my parents for always being there for me no matter what the situation was, on or off the field. I would also like to thank all the coaches that have pushed me along the way in my development so that I was able to obtain the opportunity to sign to play in college. Finally, I would like to thank all of my teammates and friends for being there with me throughout high school and making these four years memorable. Front Row (Left to Right): Kiersten Freeman (Sister), David Freeman (Father), Zachary Freeman, Chandra Freeman (Mother), Teresa Beach (Grandmother). 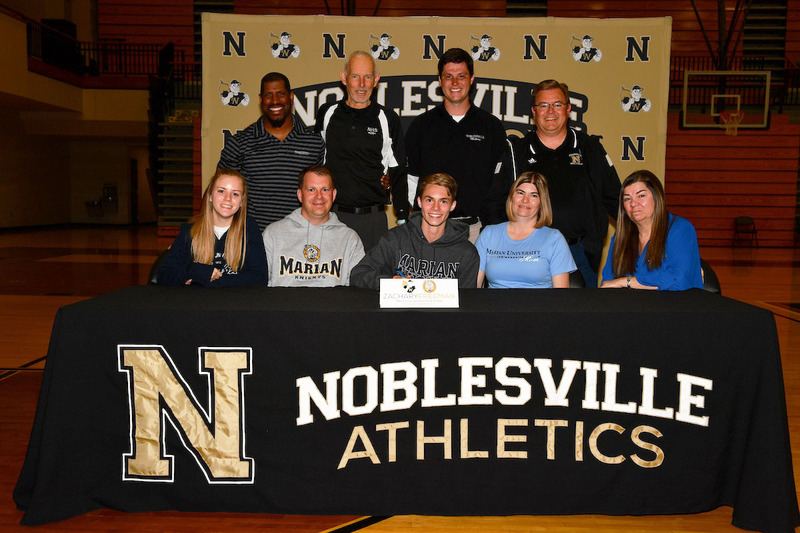 Back Row (Left to Right): Ernest Moss (Marian University Track & Field Assistant Coach), Kent Graham (Noblesville Boys Cross Country Head Coach), Jay Taylor (Noblesville Boys Track & Field Head Coach), Byron Simpson (Noblesville Boys Track & Field Assistant Coach). 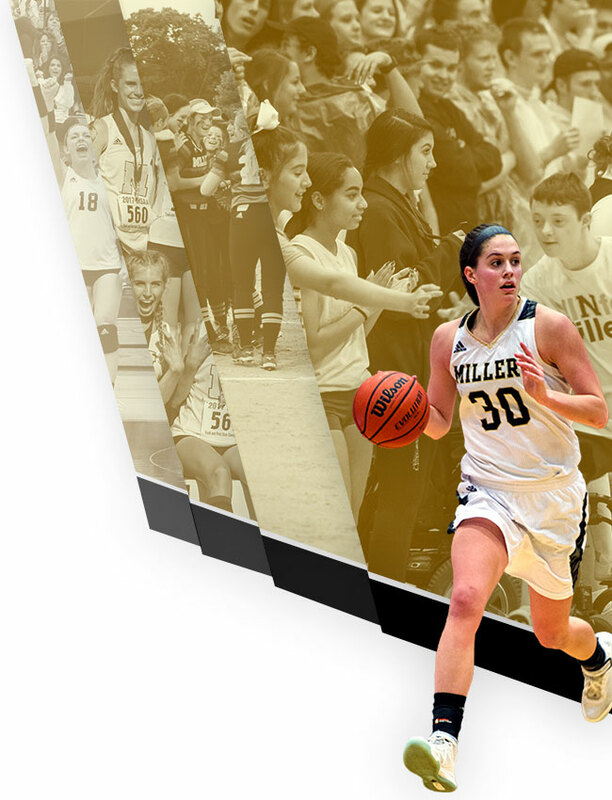 Why I Chose My School: I chose Marian University because when I went on my visit it felt like home and I really enjoyed the team. How I Want to Get Involved: As of right now, I don’t really know what activities I am looking forward to outside of sports, but I am excited to see all the different ways I can get involved and meet new people. I Would Like to Thank: I would like to thank my family for always being there and supporting me, and I would also like to thank all of my coaches for making me the runner I am today. Front Row (Left to Right): Bruce Gatewood (Father), Bryce Gatewood, Chelse Gatewood (Mother), Jim Julian (Grandfather). 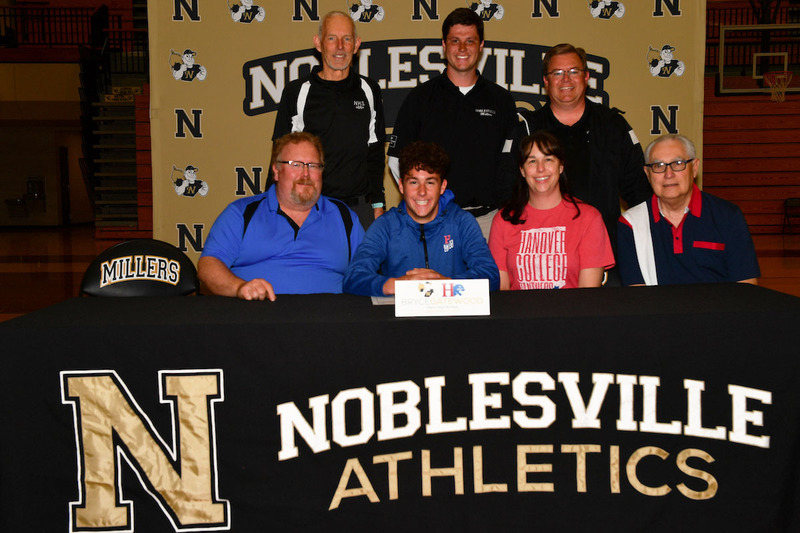 Back Row (Left to Right): Kent Graham (Noblesville Boys Cross Country Head Coach), Jay Taylor (Noblesville Boys Track & Field Head Coach), Byron Simpson (Noblesville Boys Track & Field Assistant Coach). Why I Chose My School: I chose Hanover because of the beautiful campus and the great opportunities they offer their students. The main things that interested me were the ability to study abroad, the business scholars program, and the track program. How I Want to Get Involved: I plan to get involved in the business scholars program and excel in business. Also, I plan on joining a fraternity but not sure which one yet. My Biggest Inspiration: My biggest inspiration would be my best friend and father, Bruce Gatewood. The reason I look up to him is because of his selflessness, work ethic, and how he treats everyone he meets with respect. He has always been there for me, and I hope I can become as great of a man as him. I Would Like to Thank: First, thanks to my sister, Kendall Gatewood; for always loving me, even if I stir up trouble, and always treating me as a best friend. Also thanks to my grandpa, Jim Julian; for always coming to my track meets and not only cheering me on but my teammates as well, even if he doesn’t know them. I would like to thank my coaches as well, Coach Graham and Coach Simpson, for their persistence and always encouraging me. Lastly, I would like to thank my teammates I have surrounded myself with, without you guys I wouldn’t be where I am now. Thanks for the laughs, encouragement, and being such great friends! 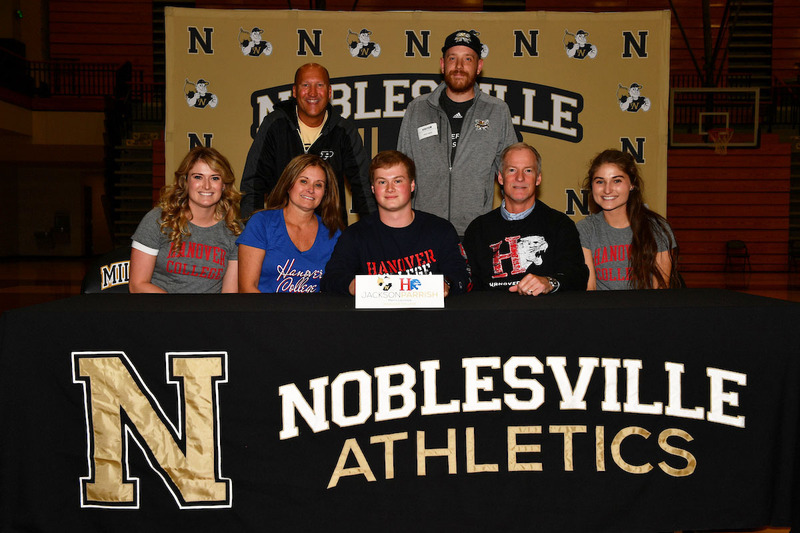 Front Row (Left to Right): Caleb Small (Noblesville Baseball Assistant Coach), Dave Gorman (Father), Kade Gorman, Justin Keever (Noblesville Baseball Head Coach). Why I Chose My School: Goshen College offered a great learning environment where I can also play baseball for another four years. The coaches were extremely welcoming and really pursued me while I was in the recruiting process. 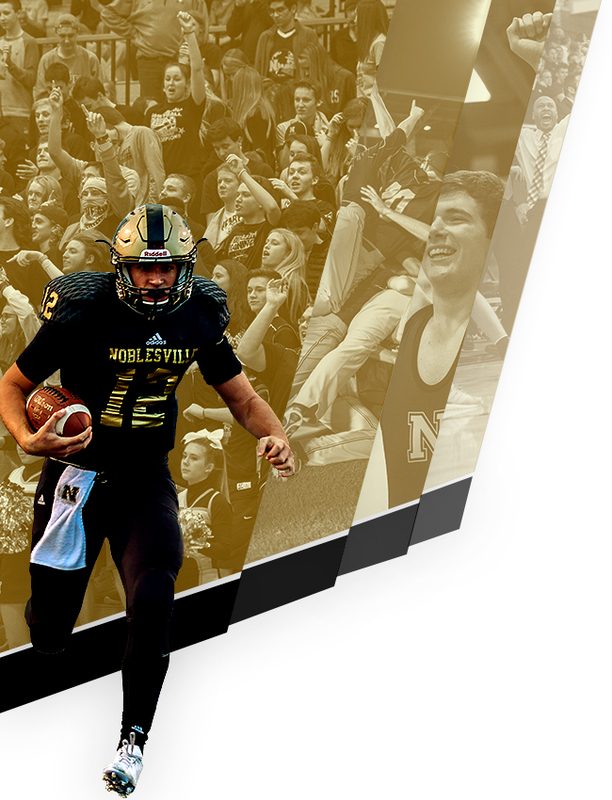 I Would Like to Thank: I’d like to thank my coaches and teammates at Noblesville. They were very dedicated in helping me become the best version of myself every single day. Finally, I’d like to thank my parents for being 100% accepting in my college choice and trying their best to help me along the way. Front Row (Left to Right): Lesley Haflich (Mother), Brooke Haflich. Why I Chose My School: I️ chose Franklin College because I️ love how small the campus was and how everything was near each other. The students and teachers that are there are very welcoming, and I like how everyone knows each other. How I Want to Get Involved: Getting involved in other college activities besides swimming is important to me because knowing other people besides the people who are participating in my sport makes the college experience even more worth it. I️ would like to get involved with different programs that will help with the major I’m looking into. My Biggest Inspiration: My biggest inspiration right now is my coach Rich Wolfred because he has always pushed me to do better, but we have always found a way to have fun with it! I Would Like to Thank: I’d love to thank my family for always supporting me with school and swimming. They are very supportive of my choice of Franklin College and deciding to swim in College! Front Row (Left to Right): Jan Helms (Mother), Aaron Helms. Why I Chose My School: I chose Lake Forest due to a combination of my love for swimming and will to work in the film industry. Though many colleges could fit one of those two categories, many failed to give both, and so Lake Forest was an excellent comprise. How I Want to Get Involved: Honestly, I hope to continue to do what I do here: tell stories, write music, and spend time goofing around and learning with friends. My Biggest Inspiration: Apart from Jesus Christ, I would say a huge help and inspiration has been my friend and current college junior Luke Conner. He has always been a great friend and mentor in tough times, and I will miss him. I Would Like to Thank: My parents (for obvious reasons), Luke Conner (for reasons stated in previously), and my team and my Coaches for pushing me to be my best self while providing an enjoyable experience all along the way. Front Row (Left to Right): Alex Parrish (Sister), Angie Parrish (Mother), Jackson Parrish, Dennis Parrish (Father), Madison Parrish (Sister). 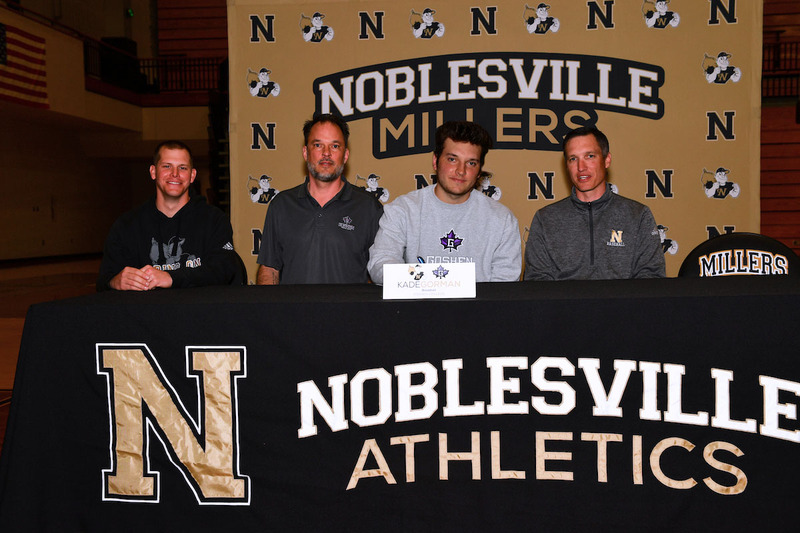 Back Row (Left to Right): Lance Scheib (Former Noblesville Football Head Coach), Mark Milam (Noblesville Lacrosse Assistant Coach). Why I Chose My School: I picked Hanover College because I loved the small educational atmosphere. I fell in love with the campus when I went on my visit, I felt like the staff and students were very welcoming, and I felt at home. 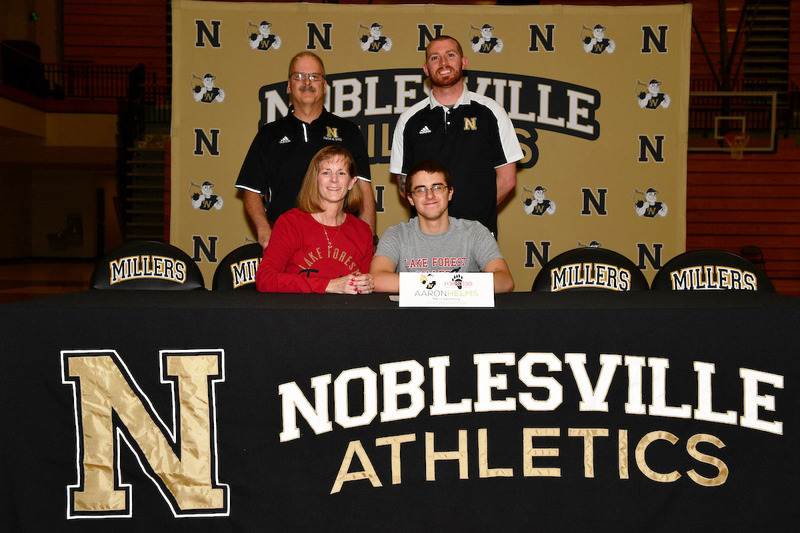 I look forward to being part of the lacrosse team and continuing the sport I love. How I Want to Get Involved: I look forward to getting involved at Hanover. I want to join a fraternity and any other leadership and or business clubs that Hanover provides. My Biggest Inspiration: My dad has always been the light of our family. Whenever life gets tough, he is always the one that is able to put a smile on anyone and everyone’s face. My dad is the definition of a role model; he leads our family by showing us what it means to be a good christian, father, and husband. I Would Like to Thank: First off, I would like to thank my parents and family for their love and support. I would like to thank my coaches, especially Coach Kyle for always believing in me, and Coach Mark for teaching me the sport I love. I would also like to thank another coach/teacher who has always believed in me and supported me through my high school career, and that is Coach Scheib. Front Row (Left to Right): Kari Roberts (Mother), Alexa Roberts, Nick Roberts (Father). Not Pictured: Steve Hawthorne (Noblesville Volleyball Head Coach). Why I Chose My School: I chose IU Kokomo because it felt like home the second I walked on to campus. How I Want to Get Involved: I am really excited to get involved with my major and be hands-on in the crime lab while finding activities to occupy my free time. My Biggest Inspiration: My biggest inspiration is my school volleyball teammates. They have always pushed me to work my hardest one-hundred percent of the time. Even when something goes wrong, they continue to make the game fun all the time. I play for them, and I always want to be better for them and so that we can be better as a team. I Would Like to Thank: I’d like to thank my parents for always encouraging me to work hard and never to give up, and paying for everything of course! 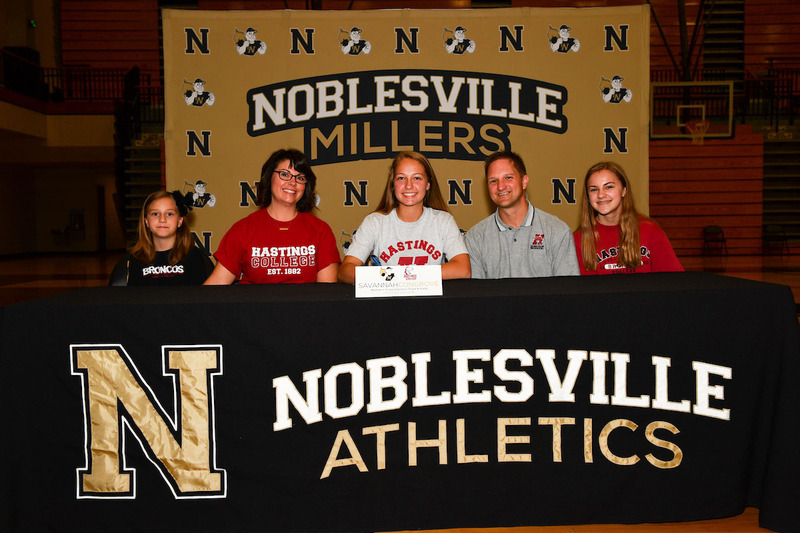 I’d also like to thank all of my coaches throughout the years because they have each taught me things that have made me a volleyball player and that has brought me to this point. Front Row (Left to Right): Sid Thomas (Grandfather), Amy Thomas (Mother), John Thomas, Jeff Thomas (Father), Mona Thomas (Grandmother). 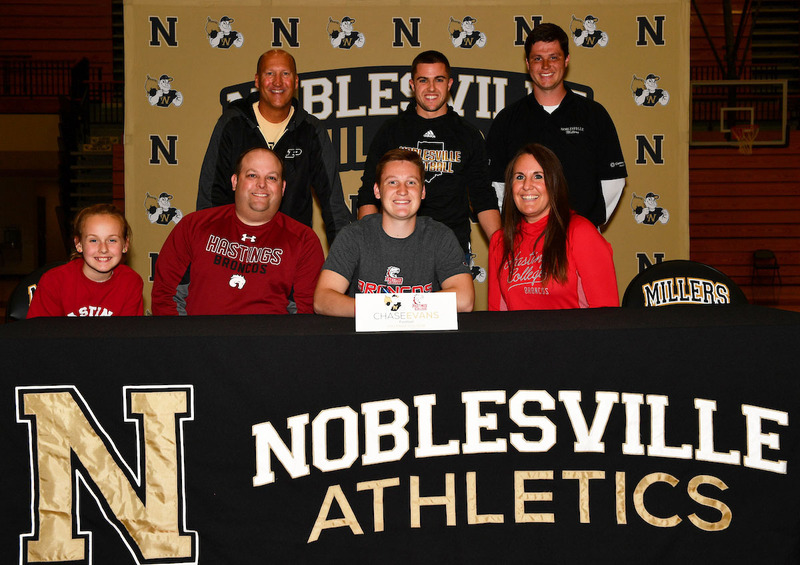 Back Row (Left to Right): Mark Milam (Noblesville Lacrosse Assistant Coach). Why I Chose My School: It is the right place for me to set myself up for success in adulthood. How I Want to Get Involved: I want to continue with best buddies and keep on spreading inclusion. My Biggest Inspiration: My biggest inspiration is my grandfather; the way he is able to always keep a smile on his face and treat everyone he meets like a long-time friend; it’s incredible. I Would Like to Thank: Thank you to mom and dad for never losing faith even when things were bad. Thank you to all four of my grandparents for always being my biggest fans. Thank you to my sister for always being my loudest fan. Also, thank you to my girlfriend for dealing with my hectic schedule.